As a small company, we truly value and enjoy getting to know our customers outside of their names and shipping locations. Hearing stories about where our pillows will travel and how they will be brought to life makes us love what we do even more! From designers and homemakers to DIYers and shop owners, our customer-base is a melting pot of creativity and our pillow buyers keep us learning and inspired. When Peru-based company Threads of Peru reached out to us a few months ago regarding a partnership we could not have been more ecstatic. Not only does the company create stunning handmade products, but their heritage and overall mission struck a chord with us. We were thrilled to provide our eco-friendly pillow inserts for displaying their pillow covers at the annual NY NOW gift show. Today, we are excited to shine light on Threads of Peru’s unique social enterprise and we think you’ll enjoy learning about their company and mission, too! All photos used were taken by photographer Anna Watts. 1) Tell us about Threads of Peru: the background, what your company specializes in and focuses on, and your mission as a company. “Threads of Peru is a social enterprise that connects the world to handmade treasures of the Andes, helping to strengthen ancient craft techniques and empower artisans. Our vision is to empower artisans and make the world richer by connecting cultures and fostering cultural diversity. We work hand-in-hand with artisans to create beautiful, handcrafted, natural accessories and home textiles, inspiring cultural pride in the next generation and helping remote communities to thrive. We provide an opportunity for artisans, particularly women, to earn supplementary income while continuing to live a traditional lifestyle and care for their children. We dream that this will inspire young Quechua men and women to take pride in their cultural heritage and pass it along for centuries to come. The products we produce represent the work and the heritage of over 120 artisans in seven communities and four regions of Cusco, each region with its own distinct textile traditions and techniques. We also believe in providing a more sustainable future for the textile and clothing sector, linking fashion with awareness and responsibility. As a result, our commitment is to provide high quality, hand-crafted products, each piece carefully woven one at a time according to centuries of tradition. Our products foster ecological and cultural integrity, as we focus on producing unique pieces from 100% natural materials. 2) How long has Threads of Peru been in operation? How did you start? Threads of Peru was formed in 2009. In 2008, Apus Peru Adventure Travel Specialists, a Cusco-based travel agency and trek operator, worked with a group of graphic design students from Halifax, Canada who wanted to use their skills towards some social good. The students thus embarked on “Project Peru,” having chosen to create a website to promote the weavings made by the women in the communities where Apus Peru operated its treks. The project was so successful and so inspiring that two members of the design team and the co-owners of Apus Peru joined forces to found a non-profit organization in Cusco called “Threads of Peru”. 3) Share a little about your new pillow line. Did you work with unique artists or suppliers to launch the new line? We are super excited about our new pillows! 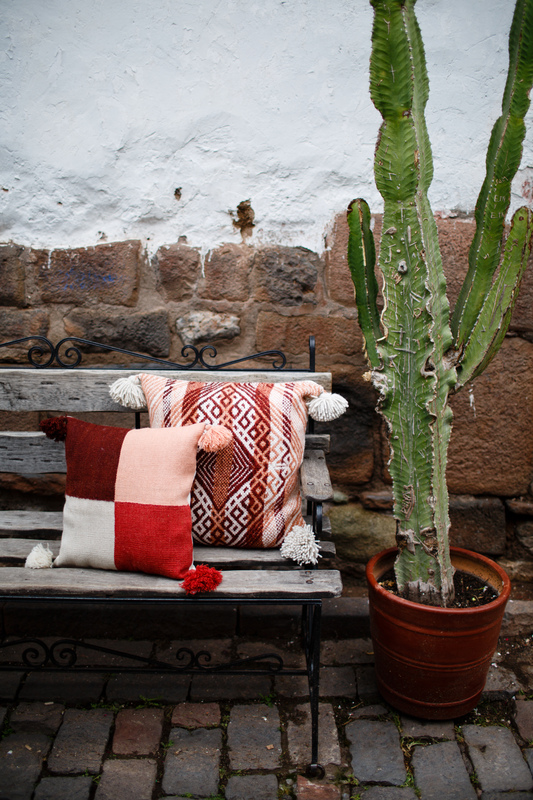 Pillows are such a great accent piece and a great way to showcase the skilled craftsmanship of our artisans and the Andean textile tradition. We were so lucky in 2017 to be connected with a New York-based designer, Jennie Lyutskanov, through an artisan support organization called Nest. Jennie designed our entire 2018 collection, including the pillows. We are offering 4 unique pillow designs in three color palettes. Each pillow highlights a particular textile technique, some of which are rarely used and in danger of dying out. The Tawa pillow features a unique textile technique called discontinuous warp and weft weaving. It is a very challenging technique and practiced by only a few. In fact, the weavers in the community where the Tawa pillow is made had to reconnect with their elders in order to learn how to weave with this technique. This is exactly what we’re all about. Despite being an ancient technique, the result was a pillow with this incredible modern aesthetic that we hope will be widely appealing. The name comes from Tawantinsuyo, the Quechua name for the Incan Empire. Tawa also means “four” in the Quechua language. The design of the Pallay pillow was our way of really shining a spotlight on a particular woven design, which are called pallay in Quechua. Typically, Andean weaving is characterized by really fine weaving and the pallay are intricate, with numerous repeats of the pattern woven throughout the textile. With this pillow, we took one repeat of one of these pallay and expanded it to take up the entire surface of the pillow, really highlighting the complexity of the pattern. These pillows are also woven with this super soft hand-spun alpaca yarn which make them not only pretty to look at but oh so huggable! We also wanted to feature this gorgeous embroidery that is practiced here, typically used to embellish a seam when two textiles are joined. We brought this embroidery front and centre on our Upis pillows, named after the community where they are made and where this embroidery technique is commonly practiced. The Upis pillows are made from a chunky, hand-spun wool yarn which give them this really cool rustic feel. 4) What sets Threads of Peru apart from similar companies? Threads of Peru stands out among our competitors through our products and our commitment to being a leading resource on Andean textiles. Our product line differentiates us from the ‘norm’ in the area of Peruvian textiles, yet we do so without sacrificing their cultural integrity, their quality or their design. We also predominantly work with alpaca, one of the finest natural fibres in the world, whereas many of our competitors focus on wool. In addition, we offer a genuine connection to the people, the culture and the craft of the Andes. We’ve been cultivating personal relationships with the artisans we work with and their communities for years, and are in direct contact with them. We are also more than just sales – we share our knowledge and love for the Andes and Andean textiles with the world through our informative website and social media platforms. 5) Tell us about your time at NYNow. What curators, artists, or designers did you work with at the show? NYNOW was a great experience for our organization! We were able to get a sense and feel for who is interested in artisan business. Getting to know other organizations like us from other countries was very fulfilling, too, especially considering that somehow our work is very similar: even though we work in different industries (ceramics, leather, jewelry, baskets, etc), we're pursuing similar or the same objectives. 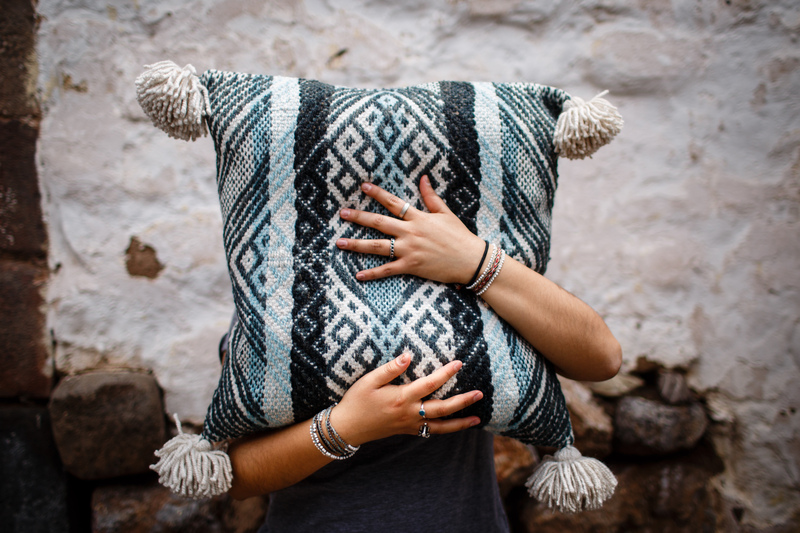 Being able to showcase our products and the skills of Quechua weavers to all types of buyers was our goal but the outcome even exceeded our expectations: we had a great response to our new pillows since they're unique and each one represents the work of at least 2 different weavers. Explaining their nature and seeing people's amazed expressions was the best part! Both before and during the show we were supported by Jennie Lyutskanov.Jennie designed our new collection and also helped us to set up our booth so that all our products could be shown and appreciated as the amazing pieces they are. 6) Why did you choose PillowCubes inserts? We really wanted to partner with PillowCubes because we thought they would be the perfect fit for our pillows in order to show them off in the best possible way. Our company is about promoting traditional culture, providing economic support to rural indigenous communities, and empowering women, but it is also very firmly about natural materials. We only work with natural fibers and dyes because we know that these are better for the environment. So for us, pillow inserts that are eco-friendly are the natural choice for our pillows. For that reason, we were so excited to find PillowCubes!